Crystal Silver and Black Hypoallergenic Hoop Earrings: Created using Japanese matte glass seed beads in black on a 30 millimeter (1 1/4 inches) silver plate hoop all on a surgical steel French earwire. 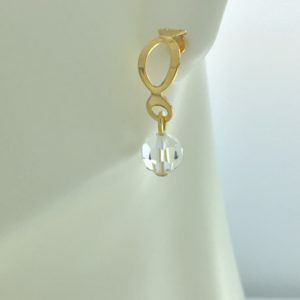 Each earring has a 6mm Swarovski® clear crystal bead dangling from the top of the hoop, and a faceted Swarovski® clear crystal teardrop at the bottom of the hoop. Swarovski is an Austrian producer of luxury cut glass crystal. These classy earrings are sure to be an eye-catcher! The earring is mounted on a French hook earwire. The earwire itself is made from a base of surgical grade stainless steel and then polished to a mirror shine. Each pair comes with a set of clear plastic earwire stoppers. The stoppers give you confidence of a secure fit so you can wear them without the fear of them falling out. Savvy Disco Designs jewelry is handcrafted by Virginia Carlson in Fort Collins, Colorado. She has been creating elegant, unique designs for over a decade that are loved by our customers. Each of her styles are individually created by Virginia with her love of fun, easy to wear beaded jewelry. Found nowhere else on the Internet, Savvy Disco Designs Jewelry is exclusively offered at our site.